I have a clinical interest in lower limb arthroplasty and have a subspecialty interest in hip surgery. 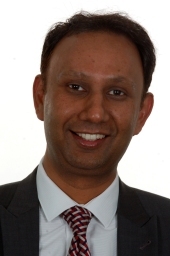 Over the years as an orthopaedic surgeon, I have built up practice to specialise in arthroplasty in younger patients and in primary and revision hip replacements. By using different implants such as ceramic joints and resurfacing, I am able to offer each patient a choice in their surgery. This includes resurfacing hip replacements and ceramic on ceramic hip replacements.